Whenever I take the short trip from my home here in London to various spots on the Thames River, Ontario, I always bring along a variety of baits and lures. Invariably I end up fishing, a least for a short period of time, for something other than what I had intended. This past opening weekend was no exception as we had set out to cast jigs for walleye and spinners for pike in the river near the small town of Komoka. Instead we caught a number of white bass (a new species caught for me) in some deeper pools adjacent to current using both a silver blue fox spinner (#4) and white Berkley Power Grubs on a 3/8 oz jig. I also spied a number of large fish splashing through a heavy, fast flowing riffle and thinking (mistakenly) that they may be spring steelhead I quickly set up a float rig with a garden worm and began casting. Second drift through my line was hammered hard, I set the hook and was rewarded with line peeling out across the river. When I finally landed the beast my first thought was that it was some sort of odd blue-green coloured carp. Closer inspections found no whiskers on its chin – ruling out my carp theory. 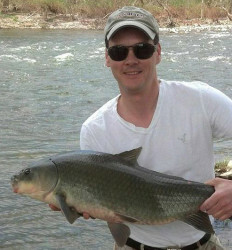 After a bit of an internet search, bigmouth buffalo appears to be the catch – my second new species of the day. This variety is the beauty of the Thames River. 94 fish species have been recorded along its length (out of a total of 165 species for the province of Ontario). There are a wide range of habitats present and a number of large migrations of species from Lake St. Clair. This “Thames River Fish Facts” sheet highlights some of the major attributes of this river and also lists the 94 species present. Well worth a look. P.S. Thanks to Chris for taking (and sending) this picture for me. Of course the day I go to the river without a camera is the day I catch two new species. Bigmouth Buffolo, Trip Report, White Bass.